Thank You Karyn! !, originally uploaded by Mark Koberg. I made this blanket for Mark and David for Christmas! It's crocheted and it's called the Babette Blanket. You can read more about how to make it at The Purl Bee, the blog for a great yarn store in SoHo called Purl. And you can buy the pattern as a download from Interweave's website. The pattern suggests you use Cascade 220 yarn, but I used Lorna's Laces Shepherd's Worsted instead because it's softer and it's hand-dyed so the colors are prettier. 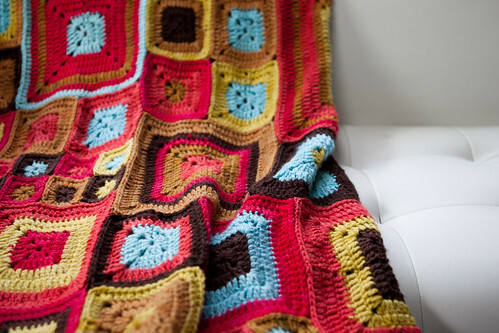 If you know how to crochet, this blanket is really easy to make. The most difficult thing about it is not cursing when you're weaving in the ends when you're finishing it. I've been working on it on and off since June, but it's easy to pick up and put down (as well as take with you on the subway) because it's just made up of a bunch of separate squares. Anyway, the best thing about me making this blanket is that I ACTUALLY FINISHED A PROJECT! (Further reading on this: The Laura's Slippers debacle of 2008-2009—she got them a year after I started making them and still hasn't gotten the hat.) I've really been working on trying to complete things and this finished blanket is a great way to start my year! Laura slippers are coming along nicely.